I have a little confession: since I wrote about Sapporo Ramen more than a year ago (one of my favorite places in Boston’s little “Japantown”), I have become sort of a ramen snob. Sapporo is just so good, and now that there are so many ramen hot spots in the city, I can afford to be more choosy. Or maybe “snob” isn’t the right word, considering I actually cooked with those instant ramen noodle packets a few weeks back when I had the flu and I just wanted a coddling bowl of soup. I think “enthusiast” is a better description for me. If by enthusiast we mean having a hankering for ramen regularly, and eating ramen at random times of the day (10 am? 3 pm? 9 pm? yes, yes, yes), then let’s stick with that. I’ve tried ramen at plenty of different restaurants around Boston, and the ramen place that now tops my list is Snappy Ramen in Davis Square. Snappy Ramen used to be Snappy Sushi, a little neighborhood sushi place in Somerville. 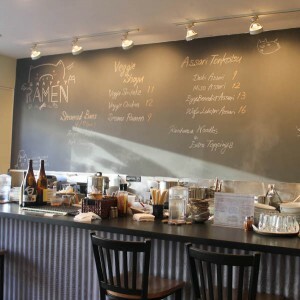 A few months ago, the place was reinvented to be just a ramen place. It’s still in the same tiny space, with a few seats at the bar, and a big communal table. 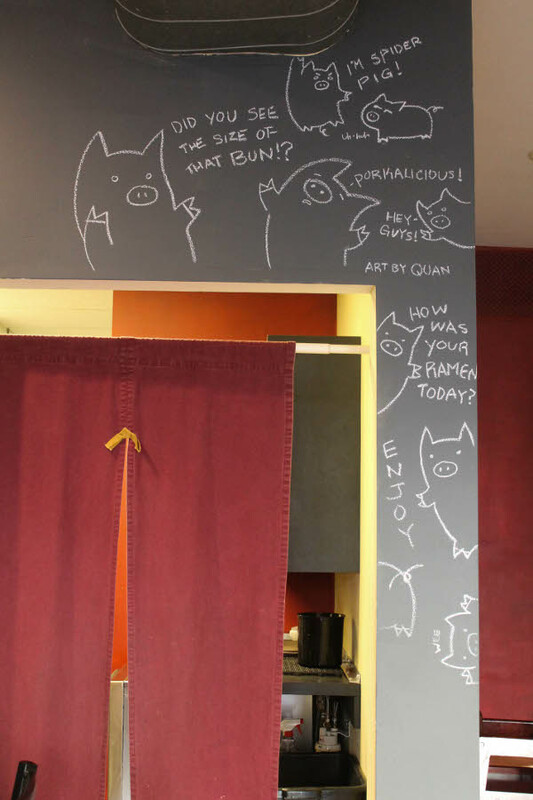 There are cute drawings on the chalkboard-painted wall, and they always have nice music playing, the feel-good sort from musicians like Stevie Wonder and The Beatles and Ray LaMontagne (aka exactly my type of music). The menu also includes a few steamed buns, beer, and sake, but the main focus is undoubtedly on ramen. 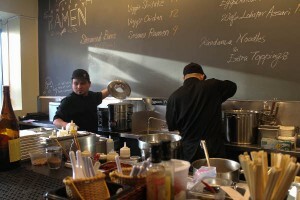 Snappy Ramen’s Tonkotsu soups are made from scratch by stewing simple ingredients. We slow cook Berkshire pork’s genkotsu bones and back fat, as well as locally grown vegetables, for half a day on high heat. There are three main types of ramen on the menu: Assari Tonkotsu, which is a combination of pork bone soup and a traditional dashi (fish stock), Kotteri Tonkotsu, which is pork bone soup that is simmered and left to rest for an additional day, and Veggie Shoyu, vegetarian ramen with a base of shiitake mushroom soup. 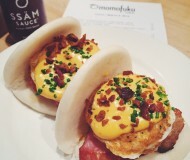 Topping suggestions were the onsen soft egg and Berkshire pork belly kanuni, both of which Mich added to her order. I tried a few spoonfulls of the signature ramen and really liked it – the combination of pork broth and fish stock made a very flavorful soup that tasted both rich and light. This is a big comforting bowl of flavor. The spicy miso soup isn’t particularly spicy, but it is gloriously salty. The scoop of spicy miso, which has the consistency of thick peanut butter, when mixed with the broth makes the soup even thicker – almost like gravy. 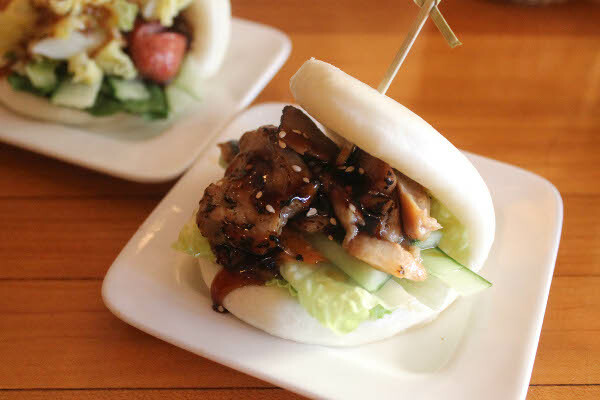 The two pieces of pork belly are tender and unctuous, each meaty bite melting in my mouth. The soft boiled egg is cooked perfectly – the yolk soft and orange. 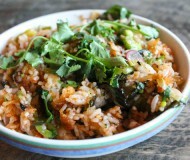 I have enjoyed this bowl on multiple visits, and I have been satiated and satisfied and so happy every time. 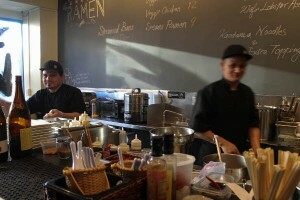 The service at Snappy Ramen is efficient, and everyone there is friendly and knowledgeable. The guys at the bar are always smiling, and they make patrons feel at home. 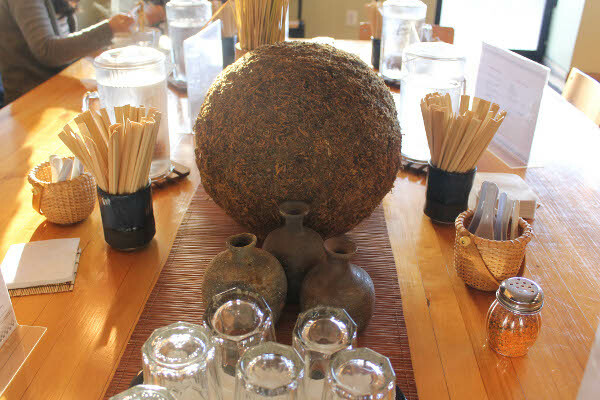 And the communal table definitely feels like we’re at home: we pour our own water, get our own spoons and chopsticks, and try not to splash too much ramen on ourselves as we happily slurp our bowls. 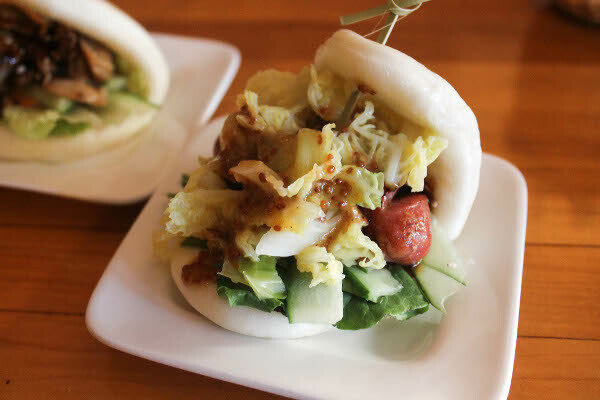 Mich and I also tried a couple of the steamed buns: Teriyaki Chicken and Pork Sausage. Both were delicious, but in my opinion unnecessary. It really should be all about ramen. Tonkotsu is not the same as Tonkatsu. 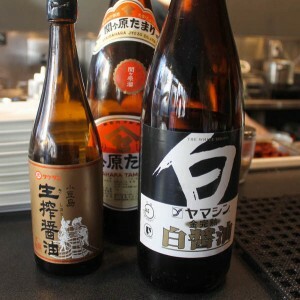 Tonkotsu means pork bone broth, while tonkatsu is a breaded and fried pork cutlet. 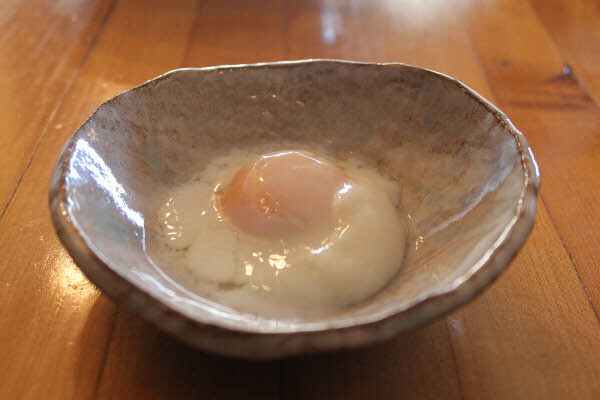 If you are going to order the onsen soft egg as an extra topping, expect a cold poached egg that comes in a separate dish. If you don’t want a cold egg, I suggest the nitamago boiled egg instead, which is a soft boiled egg that is served in the bowl with the rest of the ramen ingredients. Come hungry. The portions are huge. 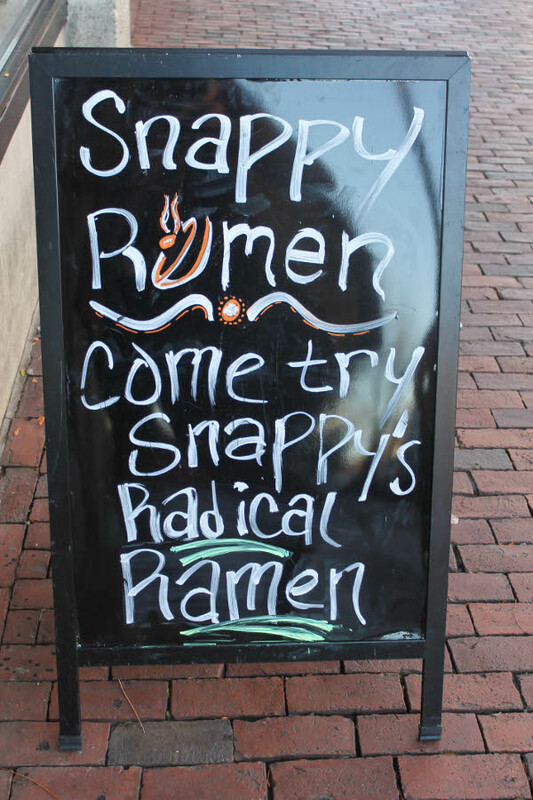 The ramen craze has already exploded here in Boston, and while there are many other ramen restaurants in the area, I highly recommend Snappy Ramen. Once you try it, you’ll become a ramen enthusiast in no time. This looks awesome and I miss you. Now I want Ramen. Because it’s rainy outside and ramen is best on cold, rainy days. I’ve been craving real good ramen the last few days but now I really want it! Looks delicious! Thanks, Pamela! 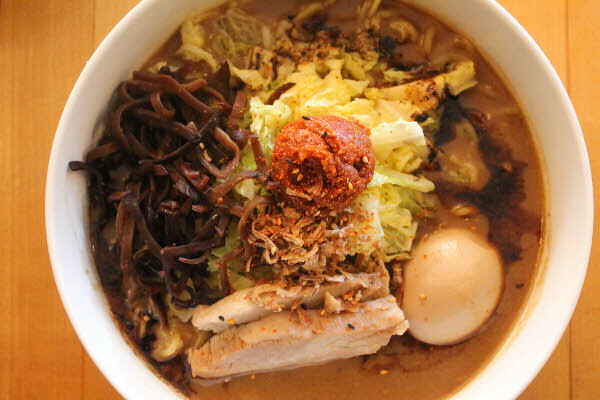 The weather certainly intensifies all the ramen cravings! we were fortunate enough to go to Japan this year- and now, ever since I’ve had “real ramen” I’m too scared to try anything in the U.S. because I don’t want to be disappointed! this is great to know about! I’m hoping I can get to Japan sometime next year. I’m sure I’ll go crazy over the food there! Awesome review, photos, and helpful hints. It’s certainly the season of ramen now! Just had ramen the other day!! lol!! Love it! 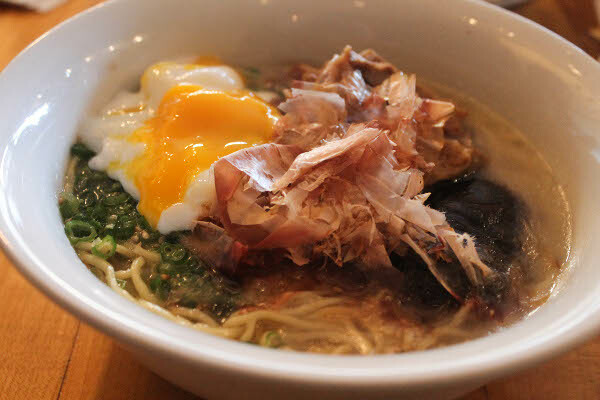 With incredible ramen like this, how can one not be a snob? It looks amazing! 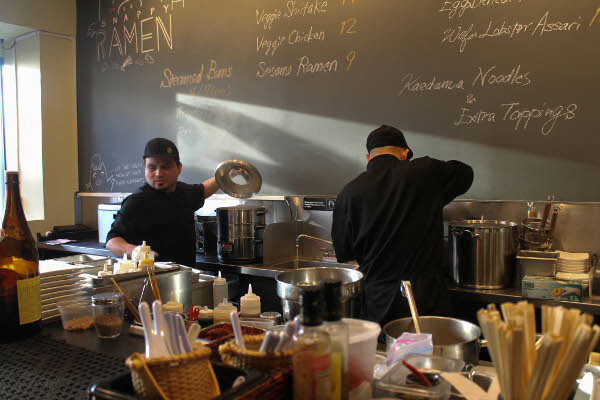 I haven’t slurped at enough ramen places in NYC, by FAR, but you’ve got me craving a bit steamy bowl of the stuff! Might have to drag the.boy out for some this weekend! This looks amazing! 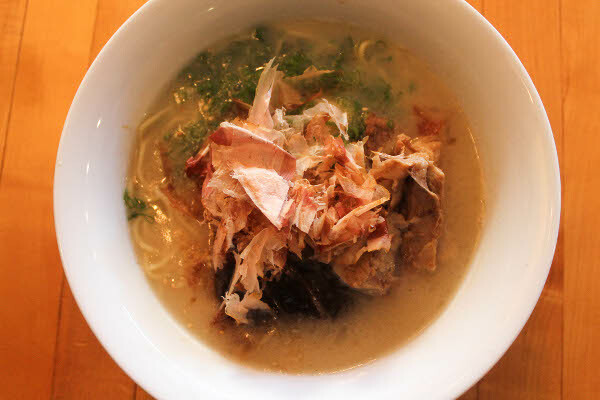 After dining at Ippudo in NYC, I have been seeking a local ramen gem. I drive by this place ALL the time, and am endlessly curious about it, but for some reason have been a bit hesitant to check it out. 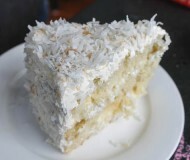 I guess I really do need to get in there and try it – sounds delicious, and well worth it! I have been craving a hot, comfy bowl of ramen, so this post made me super hungry! I’m originally from Boston and still get up there quite a bit to visit family. 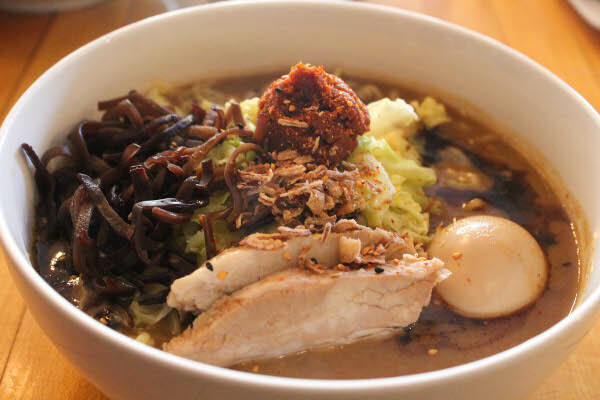 Definitely putting Snappy Ramen on my to-try list next time I’m in the area – that looks SO good! !